I just fired up my Japanese FZ-10 for the first time and immediately noticed that the yellow circle in the 3DO logo had a pink tone to it. Then the R.E.A.L logo was outlined in pink. Then the bios screen with the bouncing objects was pink instead of gray. Then I put in Virtual Horror and the title screen looked normal the split second after it appeared, then had a huge splotch of pink on it. I pressed start and the title screen looked normal for the brief moment before it faded out. Then the game began and the walls had sploches of pink on them, but not on the edges and my character's hand had that same pink tone that the circle in the 3DO logo had. I just checked and my NA FZ-1 doesn't do this, so it's not my TV or the AV cables. What's wrong with it? Things that aren't supposed to be pink are pink. 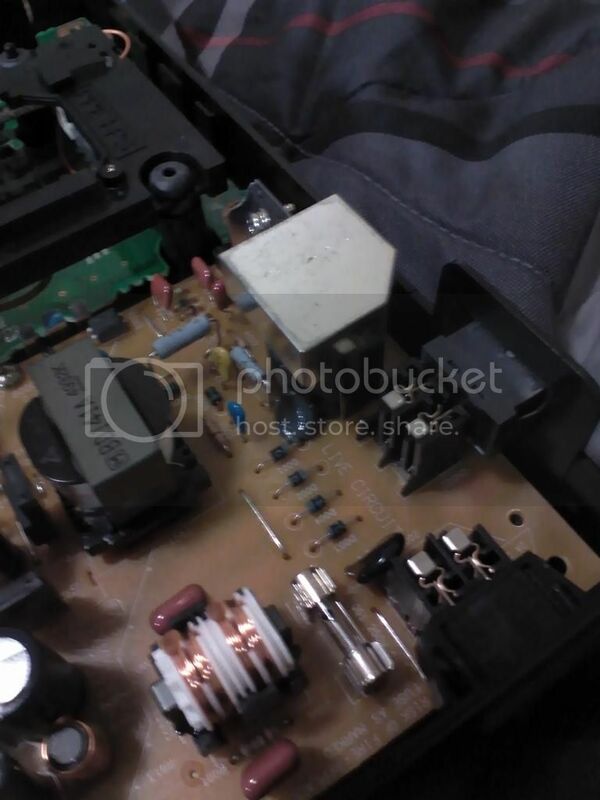 I've opened it up to look at the caps and noticed that the 150uF 200V cap on the PSU has a glob of gray "putty" near it that's forming a connection between a diode and some other components on the PSU. That's all I could find that looked suspicious. Could that be a possible cause? I don't think that that blob of putty would effect anything. If it was placed there from day one, it's non conductive, so it won't bridge any wires it touches. If it formed over time, it could be a problem, but it doesn't appear as if it has. In addition, that's the power board. I don't think such a specific problem as missing a color shade would be caused by that. It sounds like an issue with the video circuitry. However, from looking at RGB mods, the video circuitry is much more complicated than it needs to be and a blown component on one of the all-too-many internal video lines could be causing the issue. That's a lot harder thing to diagnose because it might not have failed visually and the parts are typically smaller there. If the cables and TV are already tested and ok, it can only be the video circuit as Aer Fixus has said. Are you using the composite output? Have you tried S-Video? The more I thought about it, the more complicated/impossible to fix this sounded, so I sent it back to Japan for a refund. I'm really disappointed, but I didn't feel like sinking the time/money it would take to even diagnose the problem. Now I'm kind of wary to ever get an FZ-10 again. I wouldn't be wary about getting another FZ-10. I've literally never heard of a problem like this in any 3DO, ever. It sounds like a unique problem to this unit. It's very unlikely that it would happen again. One of the things I love about repairing video game systems is that problems are usually known and documented because units are almost always identical. Sometimes, though, there's a one-off problem that would take much more time than it's worth to try and figure out what's wrong. If you have a choice to return it, that would be the best option. On the other side, make sure to thoroughly test what you can test. Who knows. Maybe the AV circuit is acting up on only one of the output methods. Test out everything you can (RF, Composite, S-Video). I personally think this issue is deeper in the unit than this, but there's still the potential it's something with the particular port or associated circuit. If that doesn't help and you aren't prepared to send it to someone to get repaired, returning it is the best option. In addition, are you skilled in soldering? Even if we were to find the issue, it would likely be a part replacement and you should consider if you are prepared to fix it yourself, anyway. It would be small surface mount work which isn't hard per se, but it's not what you should start learning on as it isn't easy either. I wanted to test the s-video signal, but my trinitron and my Samsung flatscreen only have composite and component. I don't know how to solder at all, so fixing it would require shipping it to someone else and paying them for their efforts. I shipped it back to Japan a couple of days ago. It's a shame because I won it for quite a bit less than what they normally go for. I'll keep my eyes peeled for another one.